RPI’s new Curtis R. Priem Experimental Media and Performing Arts Center (EMPAC) is a perfect facility and situation for a conference (in the most general sense). 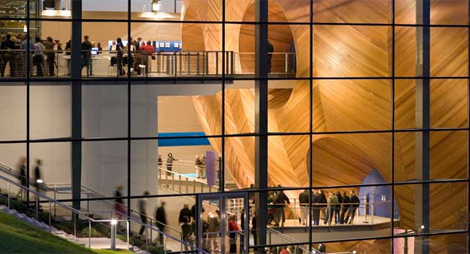 EMPAC has to play in bridging between the arts and design, on the one hand, and mathematics, science and technology on the other, using cybernetics as a bridge. Rensselaer Polytechnic Institute (RPI) is ideally located in the geographical center of US East Coast hothouses in arts and design, and developments in cybernetics and associated subjects. There are major international airports in New York (JFK, Newark); Montreal and Boston. The nearest airport to Troy is at Albany NY. One easy way to travel to Troy is to fly to New York (either JFK or Newark airports). You will then take an Amtrak train from Pennsylvania Railroad Station in New York City to Albany Rensselaer (12 trains a day). The trip takes 2 1/2 hours going up east side of the Hudson River, and is very beautiful. The trains are comfortable and the seats generous. You will need to take a taxi from Albany Rensselaer station to either the conference or your accommodation. The cost is about $20. From JFK: take the air train to Jamaica station. Change to the Long Island Rail Road and get a train to Penn Station. From Newark: take the air train to Newark Airport Station. Change to a train to Penn Station (you will need to ask which routes are cheaper: but they are MUCH cheaper and take only a few minutes longer). NOTE Penn station in New York is big, confusing, and there are no maps on the internet or in the station. Allow time there to get lost, specially if coming from JFK. Platforms are also narrow and you may have to climb stairs. Book your ticket beforehand, and get it issued by the machines. There are also trains from Montreal, Boston, Buffalo and Toronto. Busses are another option, as is hire car. There are regular trains from Manhattan to Albany-Rensselaer station, a ride of about 2 hours, and a daily train from Montreal. Trains also go to Niagara Falls, for access to Toronto. If you plan a holiday (vacation) you might look into tourist tickets. There are reductions for seniors. Car hire is also possible and can be quite reasonable. Fuel charges in the US are still considerably lower than in Europe. RPI publishes directions on how to get there, and the fabric of the university campus here. We will publish more details of vacation possibilities, and travel links, nearer the conference.